Garmin sets itself apart with superb video quality and useful features. In a world where portable navigation systems have been replaced by phones, Garmin innovated by adding a camera and driver awareness features to its latest Garmin DriveAssist 50LMT. Now it’s paking those same great features into the new Garmin Dash Cam 45 and 55 units. 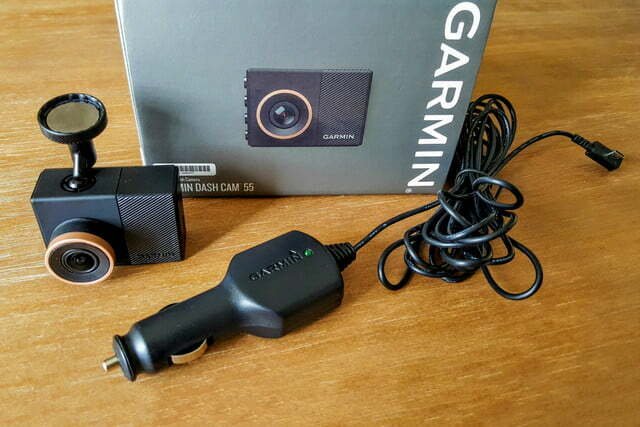 We spent some time with the Dash Cam 55 model to see if Garmin can stand out and compete in the crowded dash camera market. Both the new Garmin Dash Cam 45 and 55 feature the same compact and sleek design. Our 55 model is differentiated by a bronze ring around the lens instead of the silver on the 45. 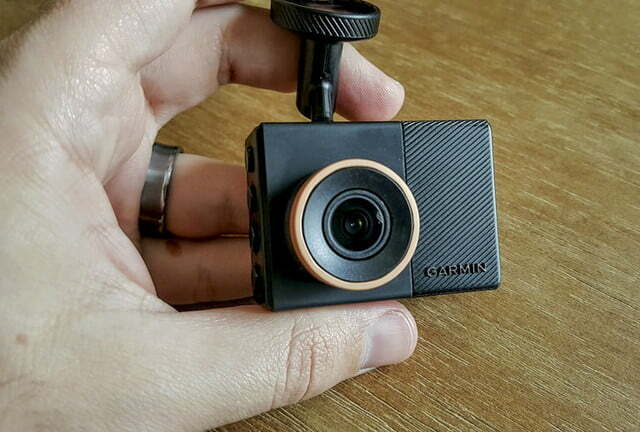 The Dash Cam 55 also ups the resolution of the camera from 1080p to 1440p and adds voice control capabilities. For those upgrades, you are looking at a $200 price tag on the Dash Cam 55, up from the $150 price of the Dash Cam 45. 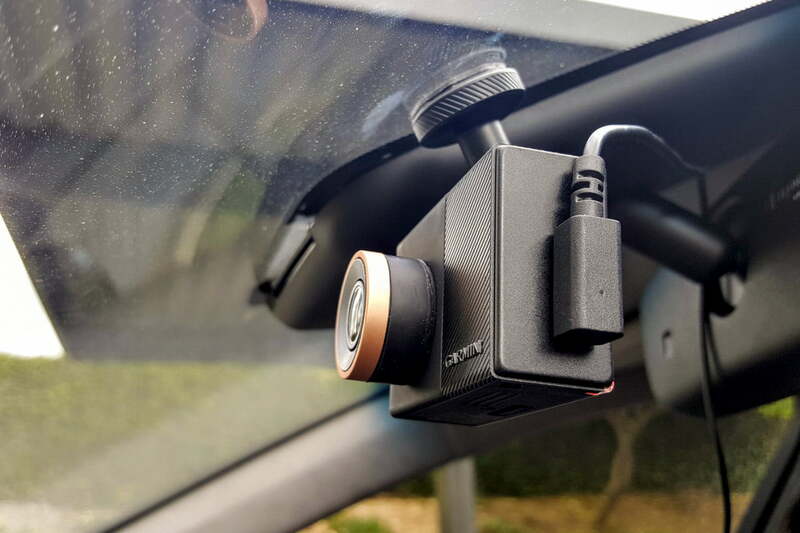 In the package for our Dash Cam 55, you’ll find the camera unit, a 13.5’ power cable, a USB cable, 8GB MicroSD card, and two magnetic mounts. 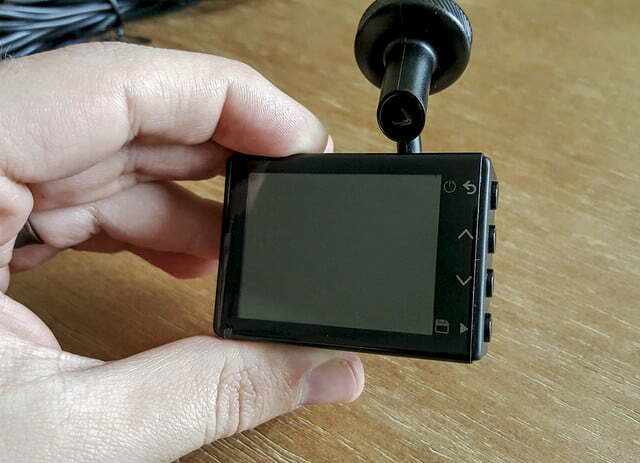 The body of the Dash Cam 55 is quality black plastic with a 2-inch LCD screen. The camera is very compact and measures only 2.2 × 1.6 × 0.8 inches (WHD). The bronze, textured plastic lens and four uniform buttons on the right side give this dash camera a very sleek and modern feel. To attach the magnetic mount that is connected to the top of the camera, you’ve got to stick one of the two 3M adhesive magnets to your windshield or dashboard. This allows for quick attachment and removal of the camera to your vehicle, but also makes it rather permanent. The 3M adhesive can be removed, but if you keep trying to attach and remove the magnet a few times, it becomes useless. We switched vehicles in the process of testing and had to use the second adhesive magnetic as the first was ruined after just one removal from the car. Setting off with the Garmin 55 is easy, and the display screen will automatically go dark after 30 seconds to avoid driver distraction. Video resolution defaults to the full 1440p at 30FPS but can be lowered to allow for more driving footage storage if you are okay with sacrificing the quality. The camera begins recording in the normal driving mode as soon as it is plugged in and will end only when it loses power, generally when you shut off your vehicle. While competitors like the VAVA Dash use a trigger button that you can mount inside your vehicle to save footage, the Garmin 55 relies on voice control. 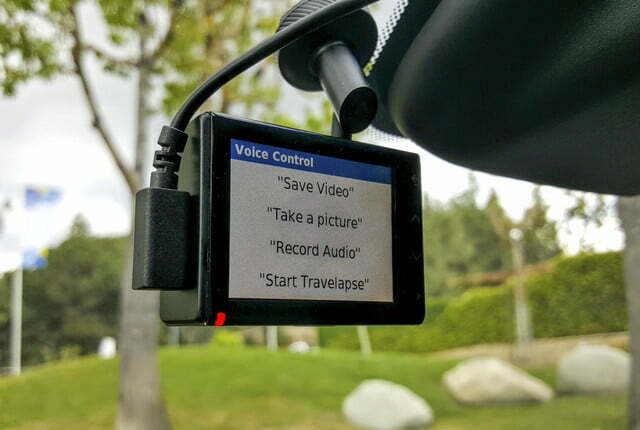 You simply need to say “Ok, Garmin” to wake up the display screen and show the four vocal options: save video, take a picture, record audio, or start Travelapse (more on that last one later). Each voice control feature worked very well and made important features easily accessible while still remaining hands-free. Quality of the video recorded in daylight is absolutely fantastic and captures each and every detail. With recordings in 1440p, you’re able to make out license plates and road signs with a clarity rarely seen in even higher priced cameras like the Thinkware F750. However, once things get dark the lens tries to enhance any light source it finds and the footage can become blown out. Street lights and the headlamps of passing cars are exaggerated more than we’ve seen on other cameras. Details can still be made out at night, but only in places with lower direct light. 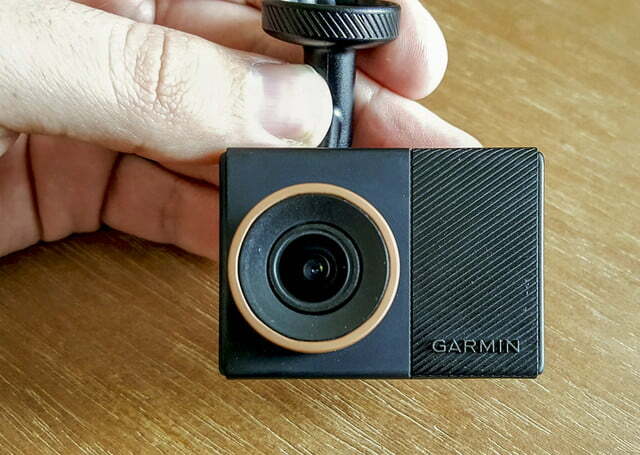 In a crowded market of dash cameras, it’s important to have standout features and the Garmin 55 delivers in that regard. Similar to several other cameras on the market, like the Magellan MiVue 420, the Garmin Dash Cam 55 offers safety features with forward collision and lane departure warnings. Unlike the MiVue 420, the Garmin system is fairly accurate and avoids most of the “false alert” situations we encountered. 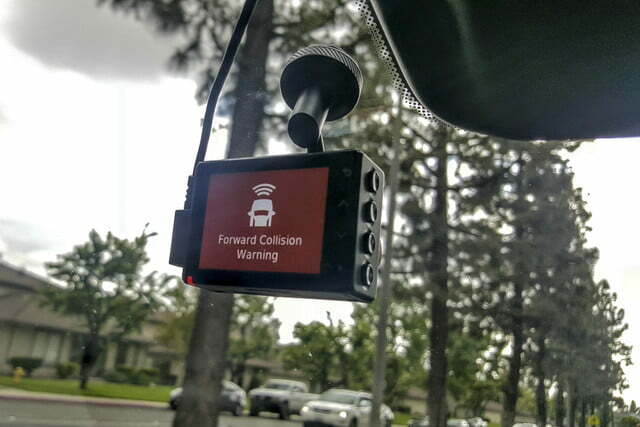 The Garmin 55 will still give warning when changing lanes intentionally, but it does a better job differentiating an intended merge from an unintentional one. Unlike other competitors, the Garmin 55 also alerts the driver when it notices the traffic moving ahead without you. This came in handy on multiple occasions when glancing at the navigation or spacing out, and helped avoid honks from following cars. 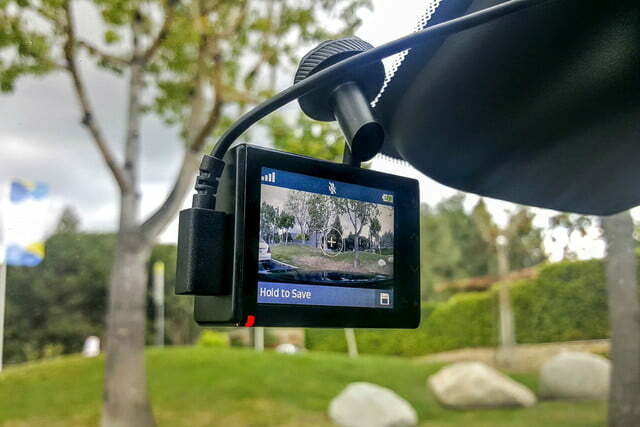 Another unique feature that helps set the Dash Cam 55 apart is the Travelapse setting. This handy feature is enabled through the vocal controls and helps condense a long drive into a shorter time-lapse video. While driving we would simply say “Hey, Garmin. Start Travelapse” to have a cool shareable video created of the current trip. 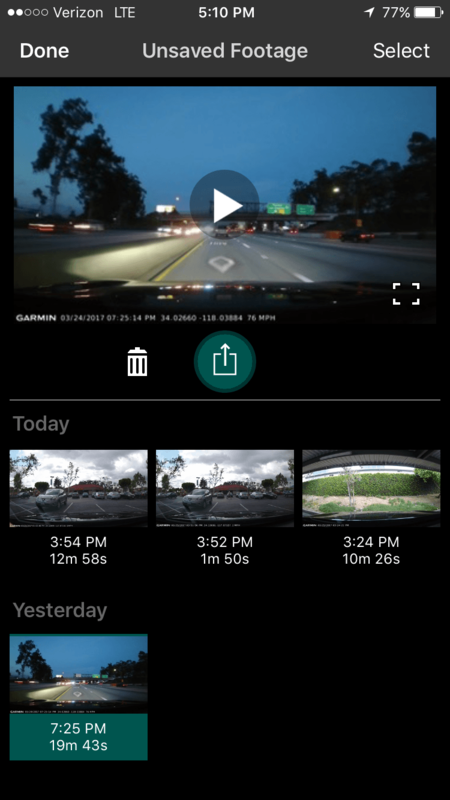 This feature is truly unique to the Garmin Dash Cameras and comes from the company’s VIRB action cameras. Sharing those clips has also gotten much easier with the Garmin VIRB application. 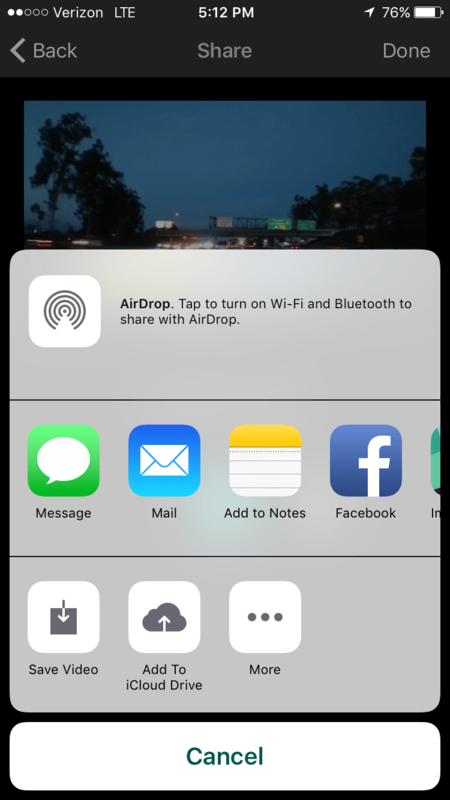 When connected to the camera’s Wi-Fi, you get a simple user interface that allows you to view, trim, and share content directly to social media. That weekend trip along the coast can now be easily recorded with Travelapse and shared to all of your followers. At $200, the Garmin Dash Cam 55 offers a ton of features and quality for a reasonable price. In a crowded market it takes more than just being good — and the unique features of the Dash Cam 55 give it an edge. No, the Garmin Dash Cam 55 delivers the best of the basic dash camera features with enough added utility to help it beat out the competition. Build quality feels solid, and assuming you don’t switch cars frequently, this product should last several years. 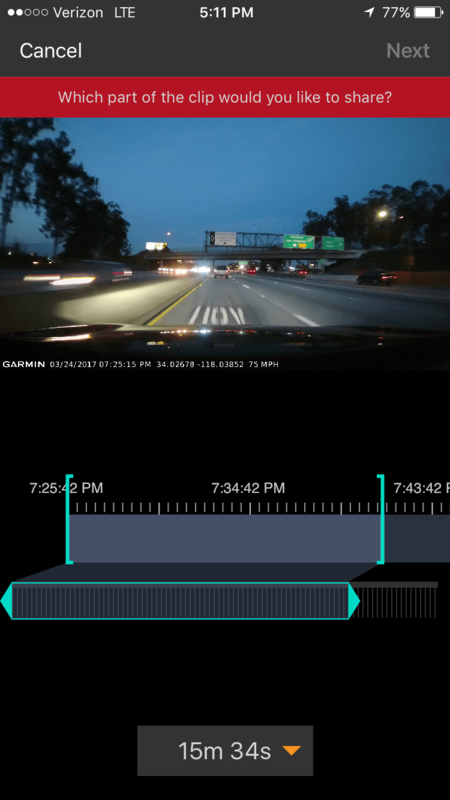 The dash camera market may be new ground for Garmin but the company has innovated ahead of the market with the Travelapse and Voice Control features. We expect every other manufacturer to be playing catch up; this Garmin platform will remain relevant for time. Yes, whether you are looking for safety, affordability, or simply to capture and share your drive, the Garmin Dash Cam 55 has you covered on all fronts.